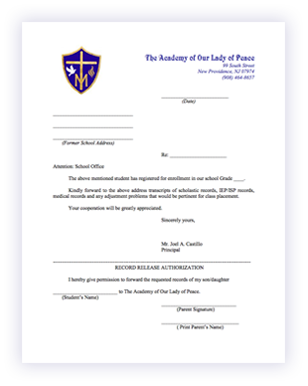 Thank you for your interest in The Academy of Our Lady of Peace. We know that choosing a school for your child is an important decision, and we want you to know that we are available to help you in this journey. You can come for a tour or just give us a call with any questions or concerns you may have. Please contact our Admissions Office at 908-464-8657 or email OfficeofAdmissions@theacademyolp.org. The Pre-K 3 child must be three on or before October 1st. The Pre-K 4 child must be four on or before October 1st. Kindergarten child must be five years old on or before October 1st.